I was just getting over a stomach bug and was scared to eat much of anything, but was STARVING. I looked in my fridge and saw left-over spaghetti with chard and artichokes. That sounded good to my tummy, but I also wanted a dose of protein. Of course I had eggs, and a light bulb went off. I’d seen eggs on pasta in restaurants before, so why haven’t I tried it at home? 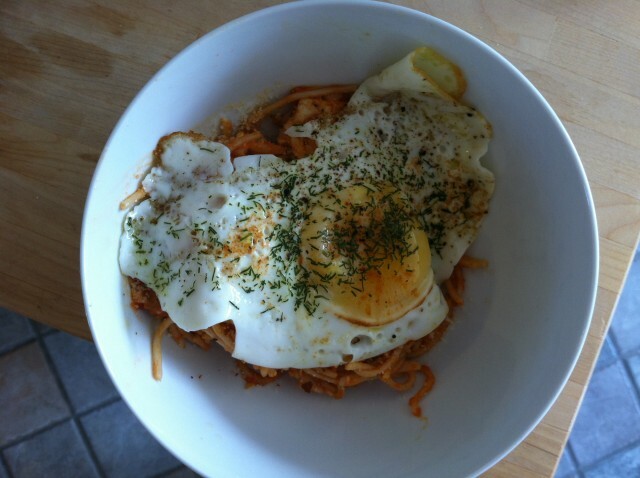 I warmed up my leftovers and made one over easy egg (with a rosemary seasoning to make it more “pasta-y”), then placed it on top of my spaghetti. The yolk oozed out like an additional sauce; it was so freakin’ scrumptious AND healthy! A meal wouldn’t be the same without some cheese, so I topped off the dish with some grated parm and lunch is served! Tip for the day: If you think of food as fuel, it will be so much easier to come up with your own healthy creations that are full of flavor AND nutrients.